Burglars made quick work of the newly-installed retractable gates at the front entrance of the Turin Bicycle Shop, 4710 North Damen, on Tuesday morning. It’s the third time that the high-end cycle store has been broken into since Jan. 12th. Alarms sounded at the shop around 5:40 a.m. and, just like before, the burglars had escaped with pricey bikes before police arrived. The store was previously hit by thieves at 4:31 a.m. on Jan. 23rd and 4:30 a.m. on Jan. 12th. Back on July 5th, a smash-and-grab burglar threw a brick through Turin’s front window and walked away with a bike. 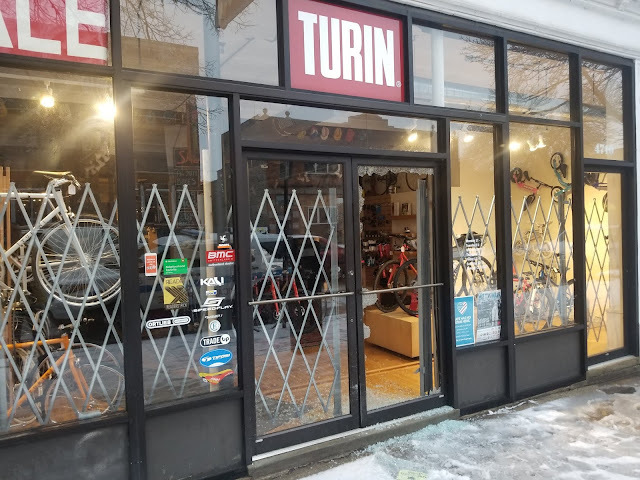 On Jan. 28th, Chicago police issued a community alert warning that burglars were targeting high-end bicycle shops on the North Side. The thieves are forcing their way into the bike shops by smashing front door glass, police said. Once inside, they take bikes and ride them to escape from the scene. Among the other shops hit was Cycle Smithy at 2468 North Clark in Lincoln Park. They lost several thousand dollars worth of bikes to thieves early on Jan. 26th. No description of the offenders was offered by police other than the suspects are male. Anyone with information about the burglaries can contact Area North investigators at 312-744-8263 regarding pattern #P19-N-030(BA). Recently, Jeremy Ross of CBS2 reported that BFF Bikes in Bucktown and Well-Fit Performance Center in West Town had also experienced similar break-ins.